Your home away from home, Oceanwalk has an open floor plan so upon entering you can see past the kitchen island, through the great room, and out to the large inviting deck. Step outside and take in the beautiful view of the lagoon; listen to the fish jumping and watch the herons searching for a snack. Beyond is the 17th fairway of Cougar Point golf course. Have fun watching TV or playing cards in the the great room with it's fire place and two-story ceiling. This room opens to the fully equipped kitchen and the large dining room (seats 10) which is just a few steps up. Off the dining room, the sun room is the perfect place to enjoy a good book away from the TV. From here step outside to the upper deck and catch a few rays on the chaise lounge while sipping your favorite beverage as you watch for Gary the Gator! The two bedrooms downstairs and the two upstairs all have sliding-glass doors which open out to the deck or to small balconies with more lovely views of the lagoon and golf course. Here privacy is assured as each large bed room has it's own en suite bathroom. There is Berber carpeting up the stairs & in all of the bed rooms and the hardwood floors throughout the rest of the house are scattered with oriental rugs. Pack the cooler and stroll (a short 5-8 minute walk) to the beach to listen to the waves or play in the sand for an afternoon. Ride a bike along the hard packed sand beach or down to Fresh Fields to shop, pick up dinner or dine out. Catch the sunset at Red's or the Ocean Course. Drive into Charleston for the day and enjoy the history, the Market, fabulous antique shops, world class shopping or the fabulous restaurants. Take the kids to the Aquarium, Angel Oak, a plantation, on a ghost tour, or on a short cruise or carriage ride to soak up the history! Charles Towne Landing Nature Park, Ft. Sumpter, a Riverdog's game, the Children's Museum of the Lowcountry, or strolling the Cooper River Bridge are all possibilities for you once you're here! Whether you play golf or tennis, ride bikes, enjoy the magnificent 11 mile beach, or just like to relax in a serene environment watching the birds, the deer and other wildlife, Oceanwalk is perfect home for you. Our property manager is available 24/7 for any emergency or non-emergency needs. Rates are subject to a 11.5% South Carolina accommodation tax. Rates discounted from rental companies. Bedroom configuration - 1 King downstairs, 2 twins downstairs, 2 queens upstairs. We invested in this area after visiting numerous times while our son was stationed in the Navy as an instructor at the Nuclear Naval Training Command in Charleston. I am retired from medical sales while my wife is a retired school teacher. Our partners in the home are a publisher of a business journal and a domestic engineer. We love the beach, nature, bike trails, and all the amenities that the island has to offer. The house is a short walk to the beach so we can go back and forth easily. We also enjoy the short trip to Charleston for the history and amazing dining & shopping opportunities that the city offers. Our house has 4 bedrooms each with it's own en suite bathroom which was important to us since we have many visitors. The open floor plan and high ceilings in the great room were also very appealing. We enjoy sitting on the deck and listening to the fish jumping in the lagoon (no doubt escaping from Gary Gator) and seeing some very interesting golf swings off the 17 tee of Cougar Point Golf Course. Being near the front of the island makes it so it easy to get into Charleston (35 minutes) & to Freshfields Village (2 mile bike ride,) which has many nice shops & restaurants and a great grocery store. Large lagoon along the entire back of house can be seen from the deck. All bedrooms have cable TV. The TV in the twin bedroom also has a built-in DVD player. Small balconies off each upstairs bed room. 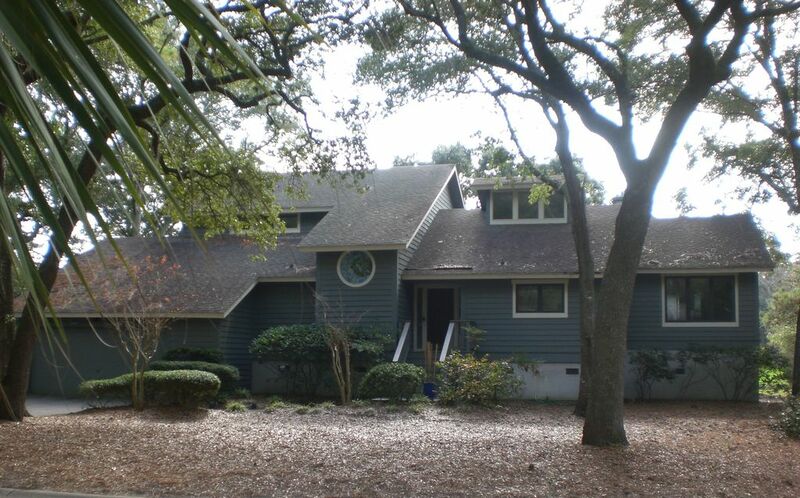 Across entire back of home; looks onto large lagoon and golf course. Pack n Play, high chair, stroller, jogging stroller, beach umbrella, sand toys, 5 beach towels, 2 canvas/net beach bags, rolling cooler, 2 boogie boards. 3 twin aero beds and bedding. Tom was an attentive host. His well stocked home was perfect for our family. We enjoyed each bedroom having a bathroom, the location, and being on a lagoon. There was a tiny gator that stayed close-by and we would go looking for her daily. Another plus was the openness of the living area so whoever was in the kitchen was still included in activities. We could not possibly express how very amazing our visit here was! Early communication w/ owner that was prompt and sincere, answering all our questions, immediately assured us we were working with a friend we simply hadn't met yet. The home was beautiful; pictures do not do it justice! It was spacious but comfortable, immaculate but livable and had so many 'extras' that made our stay so comfortable. We had some very special family time here and plan on returning as soon (and as often) as we can! Loved the beautiful home!! The back porch was fabulous!! We are just returning from a wonderful stay at this beautiful home. Leaving was very very difficult. The home was spotless when we arrived. It is located on a lagoon. Watching blue heron, lunes and egrets fishing was so serene. We did also occasionally see alligators from the near by bridge. Each of the 4 bedrooms were spacious and nicely decorated. The attached bathrooms were neat and well stocked. The kitchen had everything you could ever need and somethings you probably never thought of. The beach was within an easy walk. The owner, Mr. James, was amazing to work with. We are looking forward to returning next winter! Our daughter was married at Magnolia over Labor Day weekend and this wonderful home on Kiawah was our home base for 2 great weeks!! Echoing other's reviews regarding the pictures not doing justice to how beautiful this home is nor how peaceful and relaxing the location is. I can't really add anything new that hasn't already been touched on.....house is well equipped, bathroom for each bedroom, beautiful scenery, short walk to the beach and exciting wildlife sightings!! The owner was attentive and great to work with! Like other reviewers have said the pictures don't do it justice. It is a great home in a great location. My kids wanted to know if we could get a chair as comfy as the one in the den for our house. The kitchen had everything we needed making it easy to eat in/grill a few nights. Each BR having its own bathroom was very nice since we were 2 families. The screened in porch has AC and a door which makes it a great spot to escape for a bit if you get stuck doing some work while on vacation like I did. The deck is great and we had tons of fun watching the best wildlife - a gator that would cruise by occasionally (note that at no point did we feel unsafe), a family of deer that nestled right next to the deck, jumping mullet, and beautiful egrets and herons. Loved being able to bike around (bikes are a must and easy to rent and have delivered) and see more of this beautiful island. Will definitely stay here again! Ten Miles of Beach, Over 30 Miles of Paved Biking/Jogging Trails, Award-winning Golf and Tennis, Crabbing, Canoeing, Birdwatching, Volleyball, Soccer Fields, Playground, Shops, Kamp Kiawah, Nature Center, Kiawah Nature Programs, Horseback Riding ten minutes away, Historical Charleston 30 minutes away with Art Galleries, Antique Galleries, amazing shopping & restaurants, live theater, beautiful gardens and plantations, a Tea Plantation, Firefly Vodka Factory, Fort Sumter, Aquarium, and IMAX Theater.